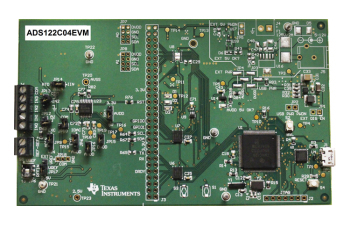 The ADS122C04 evaluation module (EVM) is a platform for evaluating the ADS122C04 analog-to-digital converter (ADC). The ADS122C04 is a 24-bit, 2-kSPS, 4-channel, low-power delta-sigma ADC with an I2C interface for sensor measurement and process control applications. The ADS122C04 also includes an integrated oscillator, reference, and PGA-enabling precision measurement of a wide range of input signals. Use the ADS122C04EVM and Delta-Sigma ADC EvaluaTIon Software (DELTASIGMAEVAL-GUI) to reduce prototype developement time and get products to market faster.